Polymariner platform being outfitted while lying on a barge. The two knobs on the roof are pad eyes for crane hooks. The 96-berth 'E' module for the semisubmersible rig Polymariner was recently delivered after a con- struction period of only six months. Norway, using corrugated steel walls as load-bearing members. A unit will weigh 50 to 70 percent less and cost one-third less than a steel unit of conventional construction. Another low-weight Trans Con- struction unit for the same platform is a 47.9 by 30.2 foot helicopter- lobby extension with arrival and departure halls, two briefing rooms, office and toilets. Marstrand and outfitted lying on barges by NSS Stalkonstruktion AB at Hunnebostrand on the Swedish west coast. Upon completion the modules were towed to Haugesund in Norway. Under the name of Jugolinija, the shipping company was established in 1947. Its fleet consists of 51 vessels, half of these being container, multipurpose and container RO/RO vessels. The company operates its regular and tramp services all over the world. Along with the change in the com- pany name, Croatia Line is expected to move to larger headquarters in the near future. September 15 and the work could last until May 1,1995. The rig is on charter to Norsk Hydro until late July 1992. Conoco, will develop oil and gas re- serves in the Haltenbanken area using the world's first concrete ten- sion leg platform. April to prepare for the installation of the 56-slot, 2,000-ton drilling tem- plate. The Heidrun program requires a second rig to be hired in 1994. Bro- kers believe the Transocean 8 was chartered at over $90,000 per day, with an escalation clause setting out rate rises in future years. 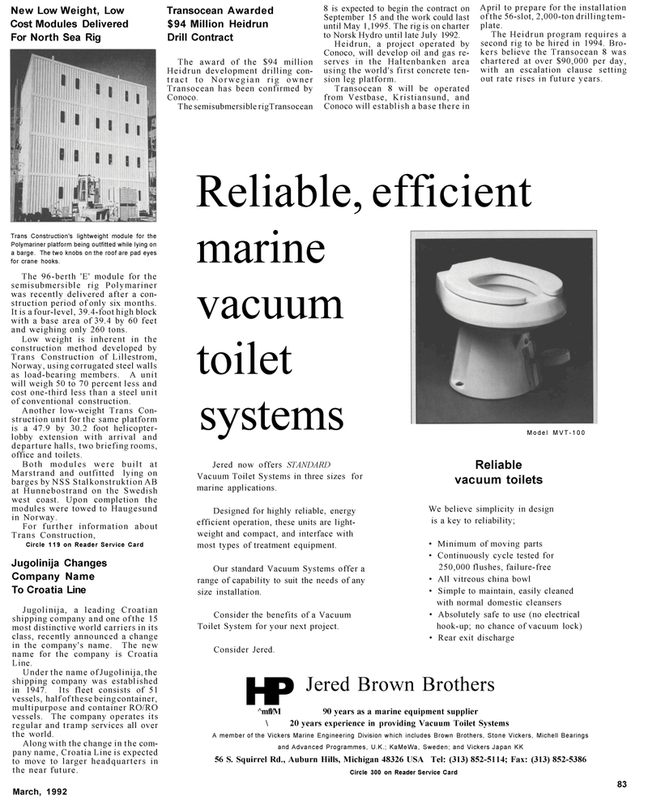 Vacuum Toilet Systems in three sizes for marine applications. Designed for highly reliable, energy efficient operation, these units are light- weight and compact, and interface with most types of treatment equipment. Our standard Vacuum Systems offer a range of capability to suit the needs of any size installation. Toilet System for your next project.